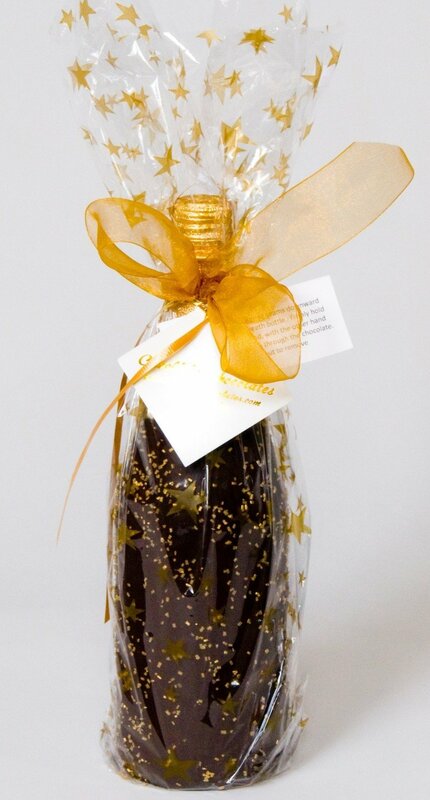 This product is Sparkling Cider, however if you bring us your Wine and/or Spirits and we will shrink wrap a bag around your (full) bottle, put ribbons underneath the shrink wrap bag, dip it in our delicious Belgium Dark Chocolate and wrap in designer paper with bow. 2 day turnaround. Such a great gift. Pull ribbons and chocolate comes off easily. Pop the Cork and Enjoy Wine/Spirits and Chocolate. We do all shapes and size bottles.